Here at Auto Barn, we understand and respect anyone's intentions of keeping their property clean and protected against the elements. Besides car care products, we offer a full assortment of products to help care for your boat as well! 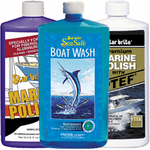 We have boat wash or boat wax formula's by Collinite or Sea Safe, plus boat cleaning products, such as mildew stain remover, teak oil, hull cleaner or bilge cleaner by Starbrite marine products. Boats and other water crafts are incredibly prone to paint and surface damage, as they are constantly at least partially submerged in water. With such an expensive investment, it would be in one's best interest to maintain a safe and healthy surface for such a vehicle to avoid expensive repairs in the future. Below is our selection of boat surface cleaners, waxes, and polishes for protecting your watercraft. Teak oil, hull cleaner, bilge cleaner, mildew stain remover, etc.